Hail is one of those subjects which is very difficult to capture in a realist landscape painting. The question is asked of the viewer: is it snow, ice or a mistake by the artist? Phenomenal natural events, like a spectacular sunset, cause a similar reaction. I did a painting with a rainbow a few months ago (here) and the same issue arose. If I didn’t give the viewer a clue as to what the ‘white’ in the painting was, would you have assumed a lighting effect, or a light fall of snow? This is the problem. I like my painting to be able to stand alone and be accepted as it is without excuses or explanations. That is the type of painting it is, but I accept this does not apply to all paintings. At one point in the painting of this picture (see video), the hail was heavy on the ground as it had been in reality. But, as far as the viewer was concerned, it was snow. 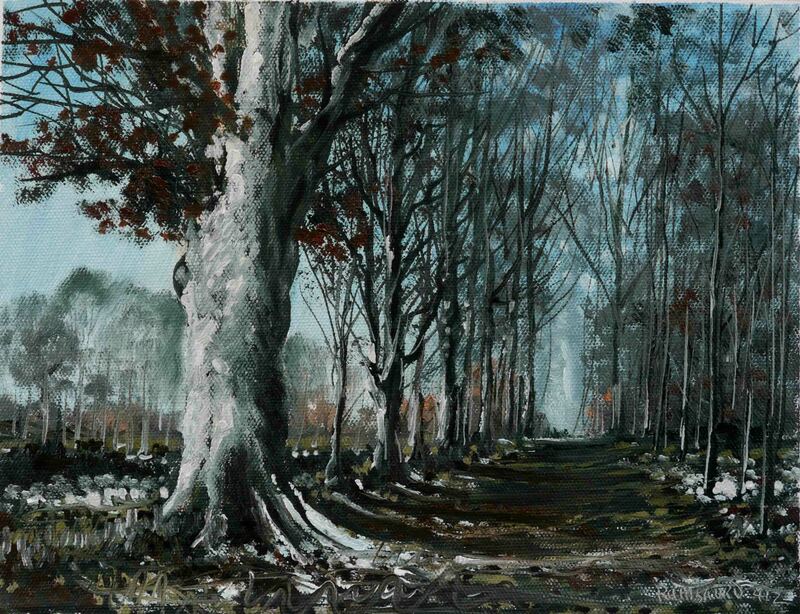 I then reduced the ‘white’ gradually by reapplying the original colour until an ambiguity existed, it could be light snow, or hail, or just dried-out undergrowth. It could survive as a ‘standard’ landscape, without the explanation, but the title ‘explains’ the rather odd white bits and why they sit in the shadow areas. The painting is quite small (11″x8″) and took about 2 hours to complete. The colours were Burnt Sienna & Raw Umber (red), Yellow Ochre (yellow) and Prussian Blue (blue), plus black and white. There was very little medium used. A tiny amount of Liquin in the final details. The initial ‘darks’ were not dark enough to create problems as the solvent evaporated, and the darker colours were some of the last bits painted and these did contain Liquin. A great painting and an excellent video. However, since you did ask, without the title I would have thought the white on the ground was just very strong sunlight catching roots and ruts, rather than being either snow or hail. Thanks John. Isn’t this the problem, how do you paint hail, without it seen as snow or strong sunlight as you said. Tricky one! I love this Liam. The hail, without the name, I would have thought was a little light snow but I was really drawn into the work, wanting to walk toward the end of the wooded path. Wonderful! I’m delighted you enjoyed the ‘walk’. Thank you. You paint so well,can’t praise enough. Enchanting. You have created woods worthy of a long walk and maybe hot chocolate after, lovely! Thank you, and I look forward to seeing your beautiful painting on your site. The hail doesn’t matter. This is a beautiful painting and I thoroughly enjoyed the time lapse video. Sometimes we should allow the viewer to finish the painting by bringing their own experiences to mind when viewing a painting. The hail inspired you to start the painting, but it’s not the focal point now, the large old tree on the left is and then the eye travels down the path and is brought back to the foreground by the spots of hail or snow on the right. Perfection! Thank you Doreen. I’m glad you enjoyed the post. You’re quite right, once the painting is finished, it belongs to whoever cares to view it.